The Xbox Ultimate Game Sale is on now, and there are quite a few good PC gaming deals to be had. 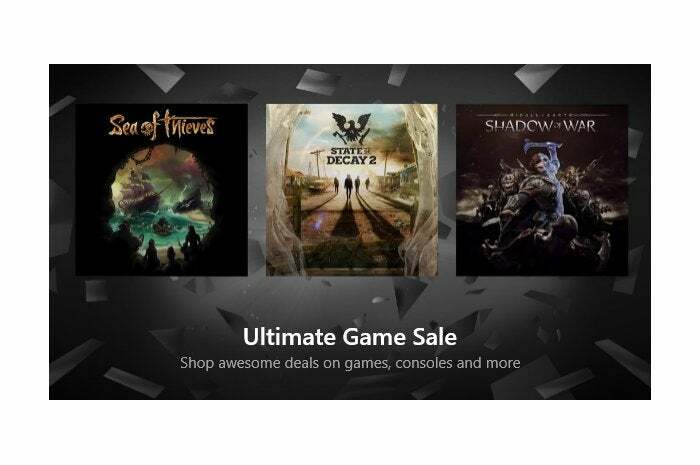 Microsoft is not playing around with the Xbox Ultimate Game Sale that runs now through July 30. There are a bunch of Xbox Play Anywhere games in the sale that allows you to play the games on either Xbox or PC. That means PC gamers on Windows 10 can also take advantage of the big deals event. Forza Motorsport 7 Standard Edition is $30Remove non-product link down from its MSRP of $60, and the Ultimate Edition of the game is $50, a 50 percent discount from its $100 MSRP. Forza 7 is a fantastic racing game, though when it came out we didn’t like the loot box system. Gears of War 4 Ultimate EditionRemove non-product link is also on sale today for $30 down from the $60 MSRP. It's another fun game, but one we had mixed feelings about. Finally, Sea of Thieves is $48Remove non-product link instead of $60, a modest deal but a game we love to play—and one that keeps adding new content for free. Ark: Survival Evolved is $24Remove non-product link from Microsoft today, while Steam is selling it for $60. The Long Dark is $12Remove non-product link, and Steam has it for $30. Everspace is also $12Remove non-product link down from $30, and Tacoma is half off at $10Remove non-product link, which we called “a pleasant and brisk experience with a stunning eye for industrial design” in our review. Finally, Resident Evil 7: Biohazard Gold Edition is $30Remove non-product link, while it’s currently $50.38 on Steam. Those are our top picks, but there are more deals to be had for PC gamers. Just make sure the games you pick are listed on Microsoft’s Xbox Play Anywhere roster before you buy or you’ll be looking for an Xbox to play them.